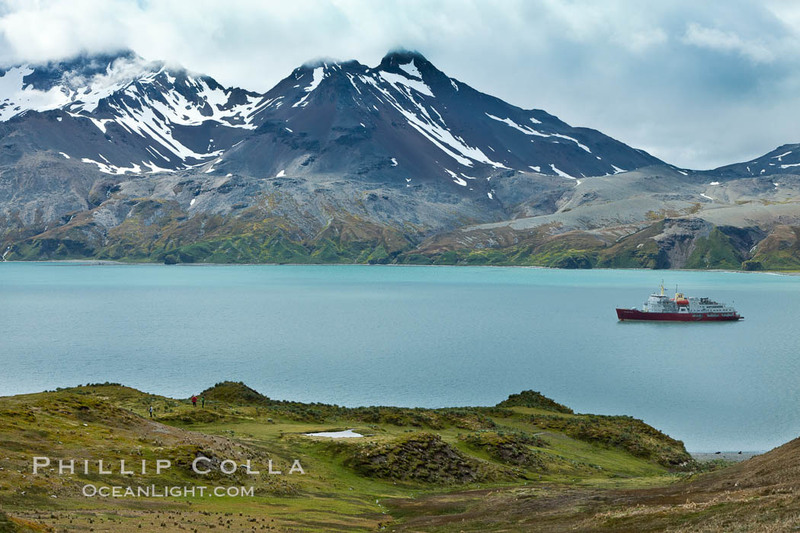 This morning we awake anchored in Fortuna Bay. Some early birds opt for a 6am landing, while others wait until after breakfast to go ashore. I go early. The beach has many fur seals and king penguins, more broadly spread about than what we saw yesterday. It is very overcast, and the light is low. The animals are soaking wet, as is the grass in which the fur seals bed down. I decide to shoot portraits, using as much lens as I have. My goal is to illustrate the long whiskers that are characteristic of Antarctic fur seals. 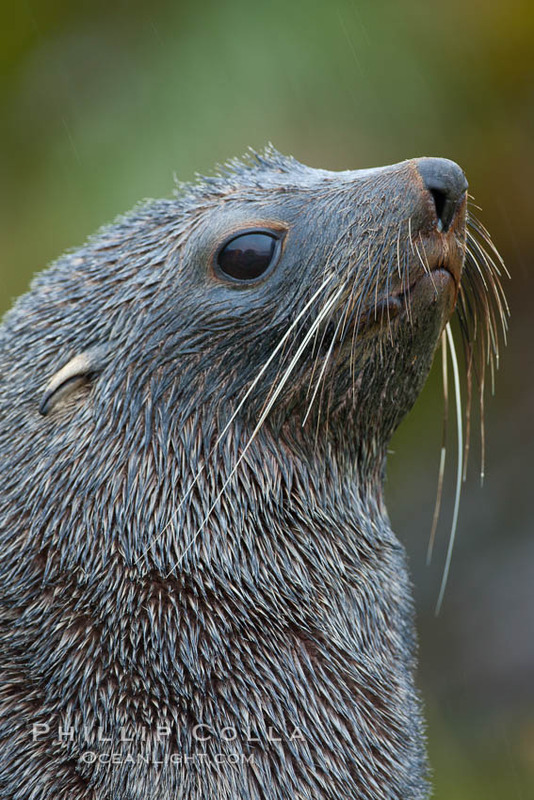 The fur seals use these whiskers when foraging for food, although the exact sense that the whiskers provide is not yet fully known. The whiskers may serve as a crude form of close-proximity radar at depths so great there is no light, providing exceptionally sensitive touch for sensing vibration in the water caused by their prey: squid and fish. 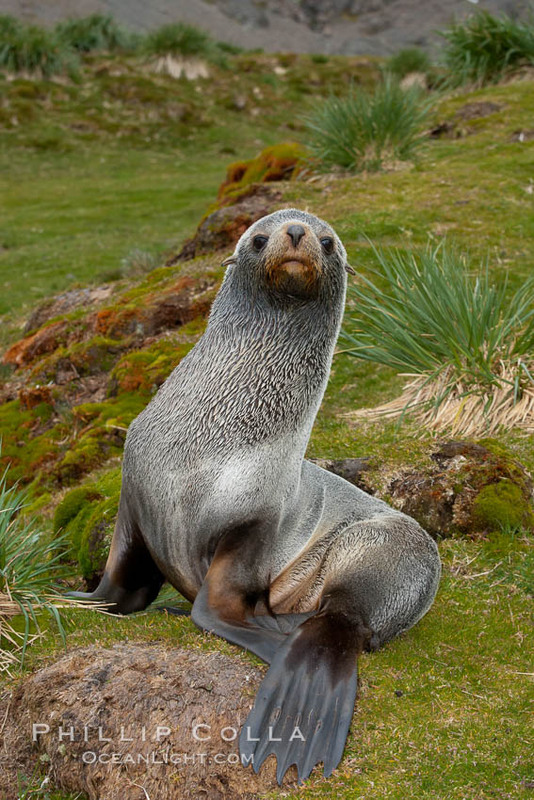 Antarctic fur seal, adult male (bull), showing distinctive pointed snout and long whiskers that are typical of many fur seal species. Most of the group arrives after breakfast by which time the fog is lifting and it is getting brighter. Above us, on the lower slopes of the mountains that tower above Fortuna Bay, is a small herd of reindeer and an area with nesting terns. I hike about 300-400’ up to see the reindeer, and am surprised to find many fur seals that have settled down on the grassy slopes high above the beach. Why do they feel the need to climb so high? It must be for the view. 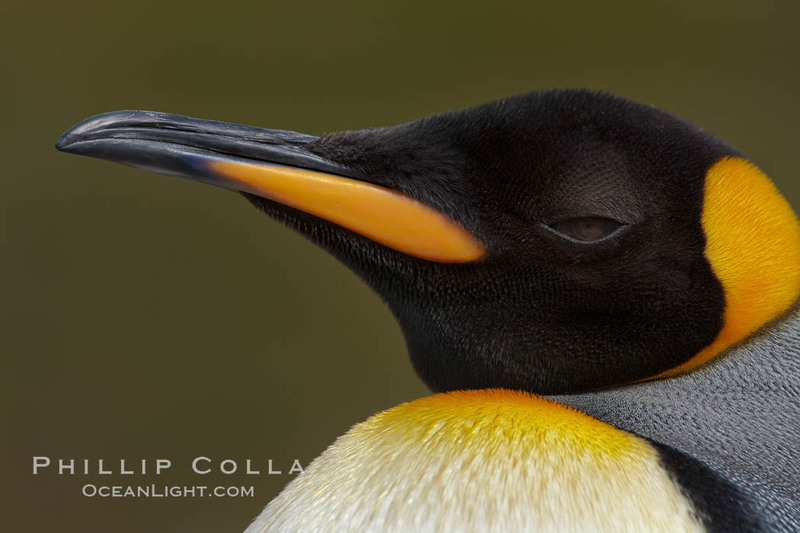 After returning down to the beach I sit down to watch a group of king penguins, several of whom approach me so closely I can photograph a single king penguin’s head full-frame. Their plumage is really something to behold. What great birds. 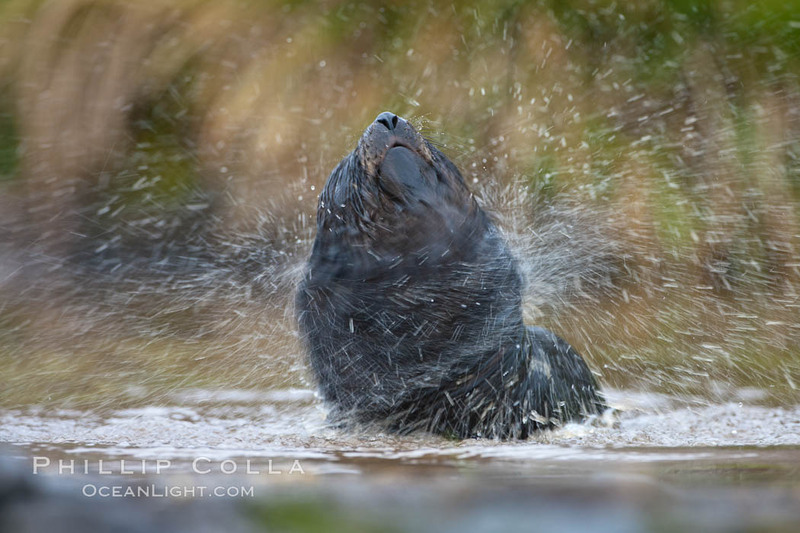 There are fur seal pups scattered among the tussock grass and playing in small pockets of water on the beach. I find one leucistic antarctic fur seal pup, so lacking in pigmentation that it appears blond. We will ony see a few leucistic fur seals then entire trip, they are quite uncommon.